There is one thing everyone agrees on: the Turcot Interchange is crumbling, and in desperate need of repair. The Interchange is a massive three-level highway that cuts through St. Henri, and since 2007, the city has been in a struggle with architects, activists, and engineers over its reconstruction. Its history is littered with social movement, class struggle, and politics. The Interchange was rushed to completion in time for the 1967 World Expo as part of a larger international movement towards developing superhighways, even amid popular dissidence and social mobilization against its construction. The Ville-Marie autoroute, which connects to the Turcot and has been included in its reconstruction plans, was built in 1970. Its construction involved destroying about 2,000 homes. This displacement was part of a series of construction and demolition projects in the name of modernization in Montréal at the time. Altogether, these projects caused the displacement of as many as 20,000 people, and fully eliminated three lower-income neighborhoods, including the former Red Light district. Shannon Franssen is the spokesperson for Mobilization Turcot, a citizen’s group with the goal of constructing “a better Turcot” and informing Montréalers about the reconstruction project. This October, Mobilization Turcot endorsed the Cure Minceur, a reconstruction plan developed by Pierre Brisset and Pierre Gauthier in 2010. Previously, Mobilization Turcot supported Turcot 375, another alternative plan that put a strong focus on public transport. However, Franssen explained that as Turcot 375 was never formally considered by the Liberal government and renovation of the Interchange has become urgent, Mobilization Turcot decided to adopt the Cure Minceur. “What we’re proposing right now is that they simplify the project and don’t make the highway bigger or increase the capacity, saving money and time,” she told the Daily in a phone interview. The Ministère des transports du Québec (MTQ) was commissioned by the city with reconstructing the Interchange. Its proposal involves renovation of the Ville-Marie as part of the Turcot reconstruction, which Brisset argues isn’t yet necessary. The city’s plan has evolved over the years, responding to some of the complaints of its opponents. Central to this discourse has been traffic volume: its environmental impact overall and its implications for the residents of St. Henri in particular. However, according to Franssen, under the MTQ’s plan, the highways’ vehicle capacities would go up, increasing the environmental impact on surrounding neighborhoods and possibly also even worsening highway congestion. Cure Minceur, which translates roughly to “diet plan”, refers to trimming down the Turcot itself and to the scope of its reconstruction. In the MTQ’s current proposal, a branch of the highway loops around to permit access to the McGill University Health Center (MUHC), which is excluded from the Cure Minceur plan. “The [MUHC] somehow managed to convince Transport Québec to start building special ramps for them,” said Brisset. Larose argued that constructing special access to the MUHC was a “good citizen” act that would be universally beneficial. Franssen challenged the notion that the planned route to the MUHC would reduce traffic through residential areas. Victor Arroyo is a filmmaker working in the Concordia film studies department. 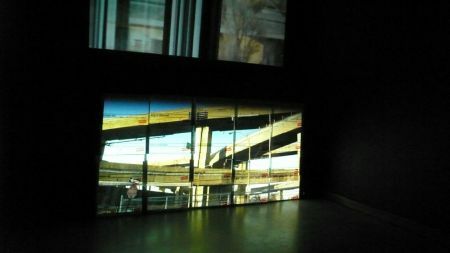 His video installation project, Turcot 2.0, centers on displacement as a result of the demolition required by the original construction of the highways, and by their reconstruction. The installation is currently on display at the Canadian Centre for Architecture in Montréal. It seems that the new provincial government may be more open to reviewing the plan than their predecessors. The MTQ is currently holding an online public forum about the Turcot project, although the project already went through the requisite public audience process in 2009. Franssen is guardedly hopeful that the government will take another look at the concerns highlighted by Mobilization Turcot and revise the reconstruction plans. The organization has put out a letter to the Minister of Transport about the Cure Minceur, which supporters can sign at turcot.info/en/letter. While Larose confirmed that the MTQ has received the Cure Minceur proposal, she refused to comment on whether it would be incorporated into the final plan and emphasized the urgency of renovation of the Interchange. Brisset argues that adopting the Cure Minceur would allow construction to start in early 2013 as planned, and that there’s still time to make changes to the renovation plan. “It’s happened before with construction plans in Montréal, even after they’d passed public audience and been ratified,” he told the Daily. The city of Montréal declined to comment for this story, citing the fact that the Turcot project is still under review by the provincial government.